Or you can call and leave a message at 647-340-0897. The clinic is located inside Gallery 555, located within eyeshot of the corner of Bathurst and Bloor St. W. The door is just East of the Midoco Art & Office Supplies store. There are 2 flights of stairs to reach us and unfortunately this is not a wheelchair accessible space. Public Transit (TTC) – The nearest subway station is Bathurst Station, conveniently located just around the corner. 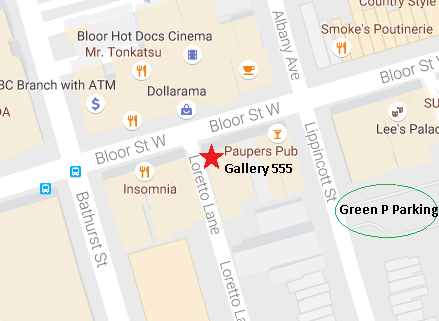 Parking – There is a Green P Parking lot behind the gallery at 365 Lippincott St, South of Bloor (see map below). There is also short term free parking on the surrounding residential streets (only 1 hour), and limited paid parking on Bloor St. in front of the buidling.